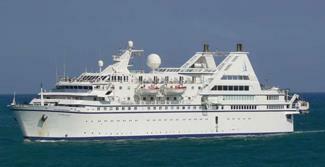 The only French cruise line, Compagnie du Ponant is an integral part of France’s great shipping tradition. Based in Marseilles France, the company was established in 1988. Each of their five yachts have their own individual personality and symbolize the art of cruising "à la française” in line with their company philosophy. 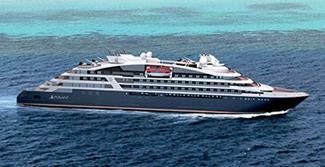 Their philosophy: to offer small capacity ships providing a unique and subtle blend of luxury, intimacy and well-being. 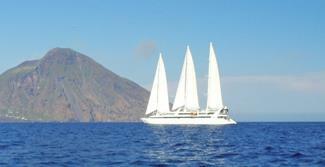 The yachts are smooth and quiet to provide maximum comfort offering several numerous eco-friendly features. Fellow Passengers: Although their ships ships attract a mostly French clientele they do have other Europeans and Americans occasionally on board. Travellers tend to be 50+, well to do, well traveled and interested in engaging with the destination. Children below 12 sharing with the parents go free. 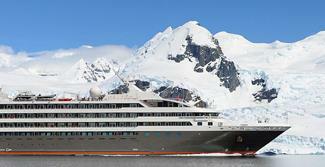 Antarctica A cruise to Antarctica will allow you to see one of the last frontier regions on earth. Experience the White continent, a unique combination of adventure and exploration. Asia From temples to skyscrapers, from pagodas to palaces, Asia is blessed with exquisite natural beauty, deep spiritual richness and enriching history. Indian Ocean Journey on a magic voyage through the atolls of the Maldives, India and the Middle east and experience natural aquariums and blue lagoons. Mediterranean Europe & Iberian Peninsula From the man-made luxuries of the French Riviera to the natural ones of the Adriatic, experience Mediteranean anthology, discover the secrets of the Aegean sea and the treasures of the Black Sea. Northern Europe & Greenland Journey through the fairy tail lands of kings and czars, cathedrals and capitals, the call of the legends of the Baltics is not easy to ignore. Voyage through the magic of the ice in Greenland. Red Sea & Persian Gulf Welcome to Arabia - the land of Sultans & Emirs, the land of honey & incense and witness the world in motion. South America & the Caribbean Let your heart beat to the passionate rhythm of South America, explore Aztec & Inca treasures and revel in the contrasts of South America. Experience the sandy beaches and hidden sectrets of the Caribbean. Following in the nautical tradition of three-masted sailing ship, experience the privilege of a relaxing cruise aboard Le Ponant. The refined life on board, the welcoming charm of your cabin, the lounges and the restaurants setting are as many invitations to relax. At first sight, the fine lines of Le Levant's silhouette strike you with their distinctive elegance. On board, you can live at your own rhythm, free to enjoy some time alone or to share friendly moments and unique experiences. An enthusiastic and intimate atmosphere prevails on board the Le Diamant: the French art of living. 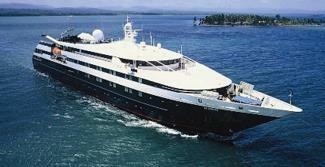 This upscale liner offers her privileged hosts refined luxury through the discovery of original coasts and calls. A superb mega-yacht with 132 cabins, the Le Boreal creates a unique atmosphere, a subtle blend of luxury, intimacy and well-being. On board, soothing neutral tones are enlivened by splashes of red, their signature theme linking tradition and innovation to create personal touches in the spirit of a “private yacht”. 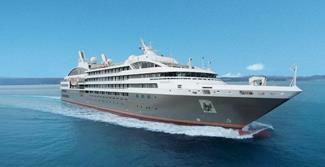 In May 2011, l'Austral will join La Compagnie du Ponant's fleet. This superb mega-yacht with 132 cabins, she offers a sleek silhouette softened by elegantly smooth contours and large, arched windows opening up to the sea and the light: so many features come together to give L’Austral her distinctive shape.